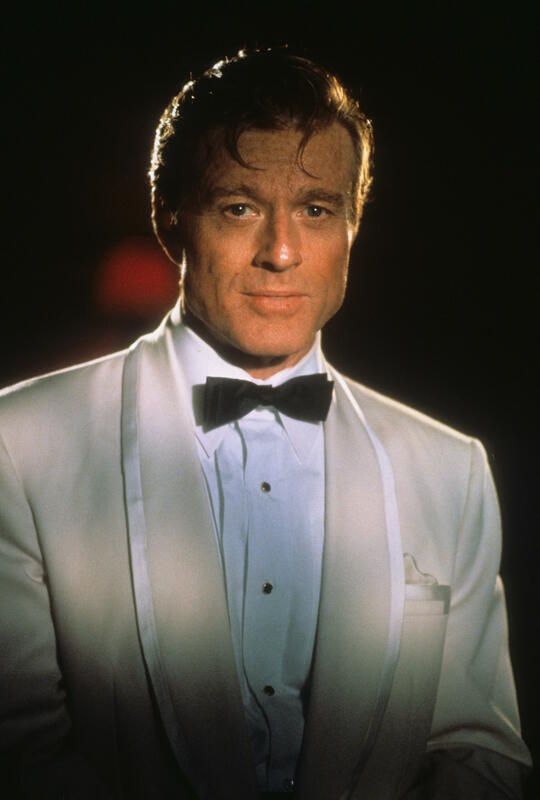 To illustrate the impression a great dinner jacket can make, BAMF Style is delivering a double dose of Robert Redford’s formalwear leading up to the new year. 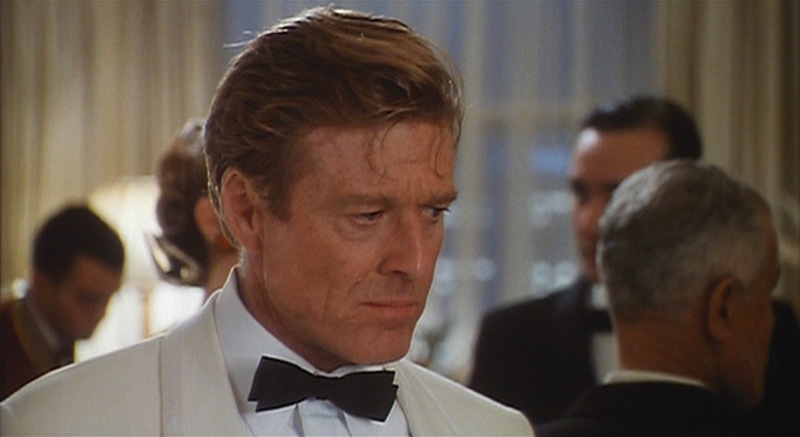 (Thursday’s post analyzed his black tie ensemble in Spy Game.) 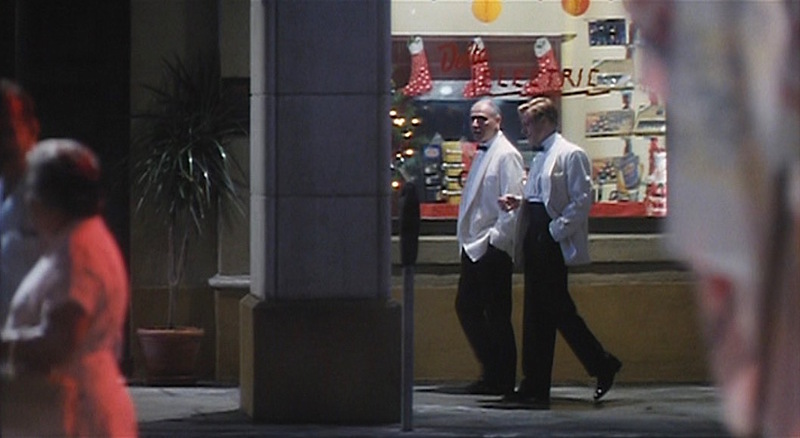 In this sequence from Havana, Jack Weil (Redford) dresses to the nines for an evening meeting with Meyer Lansky (Mark Rydell) and Joe Volpi (Alan Arkin) at one of Lansky’s casinos. 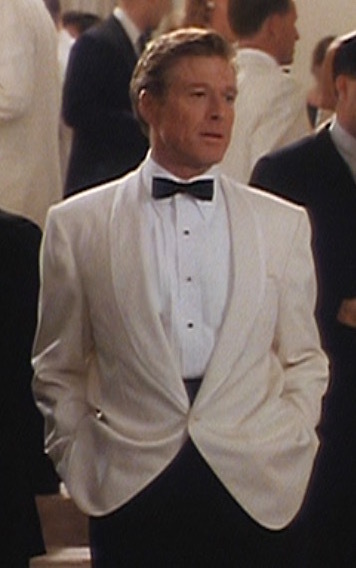 Jack sports a ivory wool shawl-collared dinner jacket, perfect for a warm evening soiree in Havana and evocative of Humphrey Bogart‘s classic double-breasted jacket in Casablanca. A Christmas tree in the background isn’t going to make meeting with Meyer Lansky any less tense. The shawl lapels are self-faced save for the strip of white satin piping along the edge. The top and sides of the welted breast pocket are also piped in white satin, further embellished by an ivory silk display kerchief poking out of the pocket. The jetted pockets are straight, and there appear to be two buttons on each cuff that match the single ivory plastic button on the front. The details of Weil’s dinner jacket set him apart as more of an individualist than Joe Volpi. 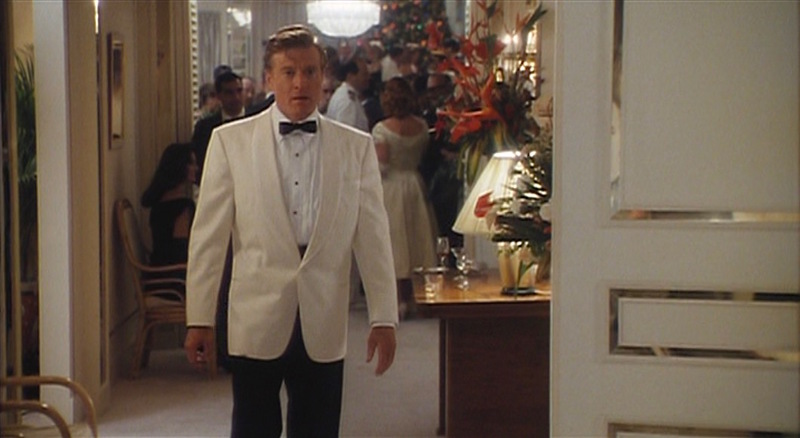 He wears a black or midnight blue pleated silk cummerbund that remains visible above the low button stance of his jacket. Cummerbunds are the most popular waist covering for warm-weather formalwear as it keeps its wearer cooler than a waistcoat would. The ventless dinner jacket is fully cut as was fashionable in the late 1950s with wide padded shoulders and roped sleeveheads. Weil and Volpi hit the streets. 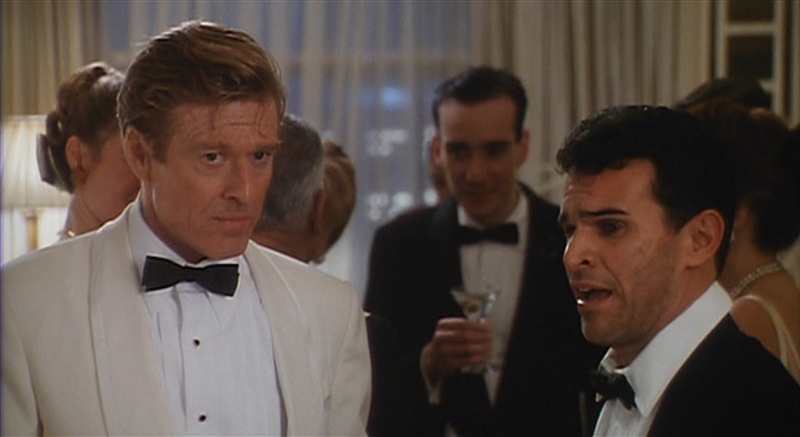 Redford once again wears an Anto Beverly Hills shirt, and Anto confirmed that this white formal shirt has five 3/4″ pleats on each side of the placket, just like his Swiss cotton tuxedo shirt in Spy Game. 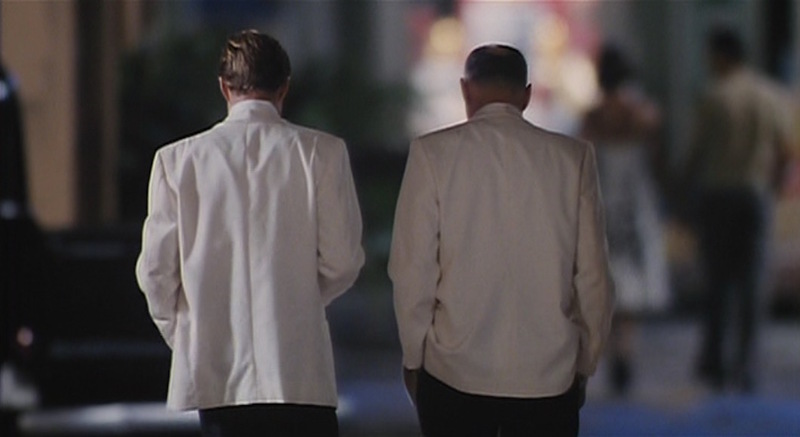 Also similar to his Spy Game shirt is the long point collar, the three gold-trimmed round black studs visible above the waist, and the double (French) cuffs for his gold cuff links. Weil’s buddy takes on a much more tragic black tie ensemble. The slim butterfly-shaped bow tie is either black or midnight blue silk. Jack wears a pair of reverse-pleated dark wool formal trousers, either in black or midnight blue with a black satin stripe down the side of each leg. His high-rise trousers also have plain-hemmed bottoms and side pockets where he often places his hands. Weil wears a pair of black patent leather oxfords with black dress socks. Weil’s accessories remain the same throughout Havana with an ornate gold signet ring on his right pinky and a gold wristwatch on his right wrist. The watch has a round yellow gold case with a gold dial and a flat gold bracelet. Weil ends his night looking cooler than ever. 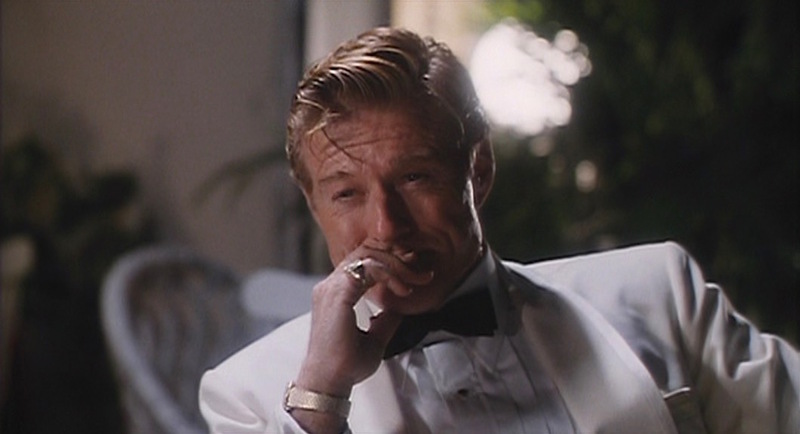 Interestingly, this is one of the few times that Redford does not wear his usual silver Hopi-gifted ring. This scene features Bobby Darin’s 1959 classic “Beyond the Sea”, but for your festive New Year’s Eve celebration, you’ll definitely want Darin’s bittersweet “Christmas Auld Lang Syne” from his 1960 album The 25th Day of December, available on Amazon. 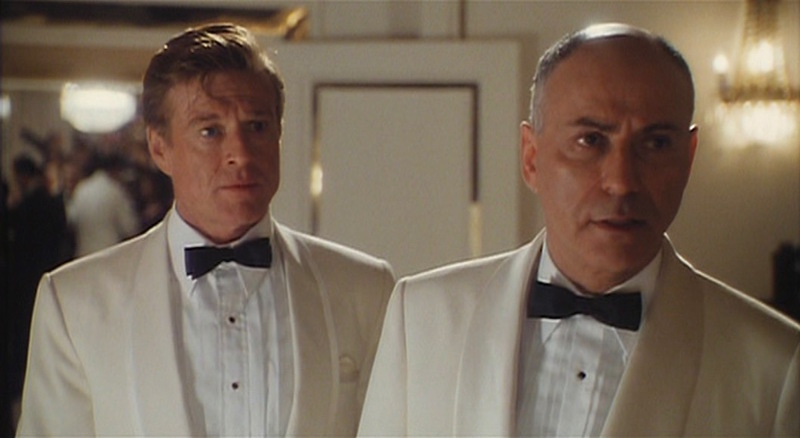 As always, Robert Redford makes dressing well look effortless. For an extra subtle touch, Weil wears a white silk display kerchief in his jacket breast pocket. …and have a happy, healthy, and safe new year!